The DisGeNET database integrates information of human gene-disease associations (GDAs) and variant-disease associations (VDAs) from various repositories including Mendelian, complex and environmental diseases. The integration is performed by means of gene and disease vocabulary mapping and by using the DisGeNET association type ontology. For more details, see the original publications: Piñero et al., 2016 , Piñero et al., 2015 , Bauer-Mehren et al., 2011 and Bauer-Mehren et al., 2010 . CURATED: GDAs from UniProt, PsyGeNET, Orphanet, the CGI, CTD (human data), ClinGen, and the Genomics England PanelApp. These data contain GDAs provided by the expert curated resources. UNIPROT: UniProt/SwissProt is a database containing curated information about protein sequence, structure and function (The UniProt Consortium, 2018). GDAs were obtained from the humsavar file. We include only the associations marked as Disease. CTD: The Comparative Toxicogenomics DatabaseTM contains manually curated information about gene-disease relationships with focus on understanding the effects of environmental chemicals on human health (Davis et al., 2018 ). From CTD we only include associations marked as marker/mechanism or therapeutic. ORPHANET: Orphanet is the reference portal for information on rare diseases and orphan drugs, for all audiences (© INSERM 1997). Its aim is to help improve the diagnosis, care and treatment of patients with rare diseases. From Orphanet we keep all GDAs. CLINGEN: The Clinical Genome Resource is dedicated to building an authoritative central resource that defines the clinical relevance of genes and variants for use in precision medicine and research ( Rehm et al., 2018 ). From ClinGen, we do not include GDAs labeled as "refuted". GENOMICS ENGLAND: The Genomics England PanelApp is a publically available knowledgebase that allows virtual gene panels related to human disorders to be created, stored and queried. From this source we keep all GDAs. CGI: The Cancer Genome Interpreter is a tool that (i) identifies known oncogenic alterations; (ii) predicts potential drivers among those of unknown significance and (iii) identify alterations in the tumor known to affect the response to anti-cancer drugs ( Tamborero et al., 2018 ). It also distributes the catalog of Cancer Driver Genes, which is a selection of genes driving tumorigenesis in a certain tumor type(s) upon a certain alteration (mutation, copy number alteration and/or gene translocation). From this dataset, we only keep validated data and do not include computational predictions. PSYGENET: PsyGeNET (Psychiatric disorders Gene association NETwork) is a resource for the exploratory analysis of psychiatric diseases and their associated genes (Gutiérrez-Sacristán et al., 2009 ). These data include GDAs provided by the resources containing information about animal models (currently rat and mouse) of disease. We have used orthology information to map the associations to the human genes. CTD Rat and CTD Mouse: CTDTM data containing Rattus Norvergicus and Mus Musculus gene-disease associations. MGD: The Mouse Genome Database is the international community resource for integrated genetic, genomic and biological data about the laboratory mouse (Smith et al., 2018 ). From MGD, we keep only the associations marked as mouse, laboratory. RGD: The Rat Genome Database is a collaborative effort between leading research institutions involved in rat genetic and genomic research (Laulederkind et al., 2018 ). We did not include the associations labeled as resistance, or no association, nor the ones annotated with the following evidence codes Inferred from electronic annotation, Inferred from sequence or structural similarity and Non-traceable author statement. These data refer to GDAs inferred from HPO and from VDAs. In the case of HPO, GDAs are inferred from phenotype-disease and gene-disease associations via triangulation. In the case of VDAs, a GDA is created for each gene annotated to the variant and the disease annotated to the variant. In order to infer GDAs from VDAs, we only consider variants that map to gene coding sequences. The variant is assigned to a gene or genes using dbSNP mappings, and the the consequence type of the variant in the gene using VEP. Only variants including the following consequence types are considered: coding sequence variant, frameshift variant, inframe deletion, incomplete terminal codon variant, inframe insertion, intron variant, missense variant, splice acceptor variant, splice donor variant, protein altering variant, splice region variant, start lost, stop gained, start retained variant, stop lost, stop retained variant, and synonymous variant. HPO: The Human Phenotype Ontology aims to provide a standardized vocabulary of phenotypic abnormalities encountered in human disease (Köhler et al., 2018 ). From the HPO, we import the genes_to_phenotype file, FREQUENT_FEATURES. CLINVAR: ClinVar is a freely accessible, public archive of reports of the relationships among medically relevant variants and phenotypes, with supporting evidence (Landrum et al., 2018 ). From Clinvar, we only import variant-disease associations with labels: Pathogenic, Likely pathogenic, risk factor, and Affects. GWAS CATALOG: The NHGRI-EBI GWAS Catalog is a quality controlled, manually curated, literature-derived collection of all published genome-wide association studies assaying at least 100,000 SNPs and all SNP-trait associations. (MacArthur et al., 2017 ). From the GWAS catalog, we keep VDAs with p-values < 1.0 x10-6. GWAS DB: The GWASdb provides comprehensive data curation and knowledge integration for GWAS significant trait/disease associated SNPs (Li et al., 2016 ). From the GWASdb, we keep association with p-values < 1.0 x10-6. LHGDN: The literature-derived human gene-disease network (LHGDN) is a text mining derived database with focus on extracting and classifying gene-disease associations with respect to several biomolecular conditions. It uses a machine learning based algorithm to extract semantic gene-disease relations from a textual source of interest. The semantic gene-disease relations were extracted with F-measures of 78 (see Bundschus et al., 2008 for further details). More specifically, the textual source utilized here originates from Entrez Gene's GeneRIF (Gene Reference Into Function) database (Mitchell,et al., 2003 ). LHGDN was created based on a GeneRIF version from March 31st, 2009, consisting of 414241 phrases. These phrases were further restricted to the organism Homo sapiens, which resulted in a total of 178004 phrases. We extracted all data from LHGDN and classified the original associations using the DisGeNET association type ontology. BeFree GDAs are classified as ‘Biomarker’, ‘Genetic Variation’, ‘PostTranslational Modification’ or ‘Altered Expression’. UNIPROT: UniProt/SwissProt is a database containing curated information about protein sequence, structure and function (The UniProt Consortium, 2018). VDAs were obtained from the humsavar file. We include only the associations marked as Disease. We applied SETH (Thomas et al., 2016) , a tool for the recognition of variations (SNPs) from text and their subsequent normalization to dbSNP build 137, to identify variant mentions. Then, the RE module of BeFree was applied to identify variant-disease associations from MEDLINE sentences. The current version of DisGeNET (v6.0) contains 628,685 gene-disease associations (GDAs), between 17,549 genes and 24,166 diseases, phenotypes and traits, and 210,498 variant-disease associations (VDAs), between 117,337 variants and 10,358 diseases, phenotypes and traits, In the tables below, the distribution of gene, disease and GDAs, and variant, disease and VDAs provided by each source. Distribution of clinical concepts, genes, and variant annotations according to the DisGeNET disease type. Venn diagram representing the overlaps among the different types of global sources (curated, animal models, and text mining). We have developed a two scores to rank the gene-disease, and the variant-disease associations according to their level of evidence. 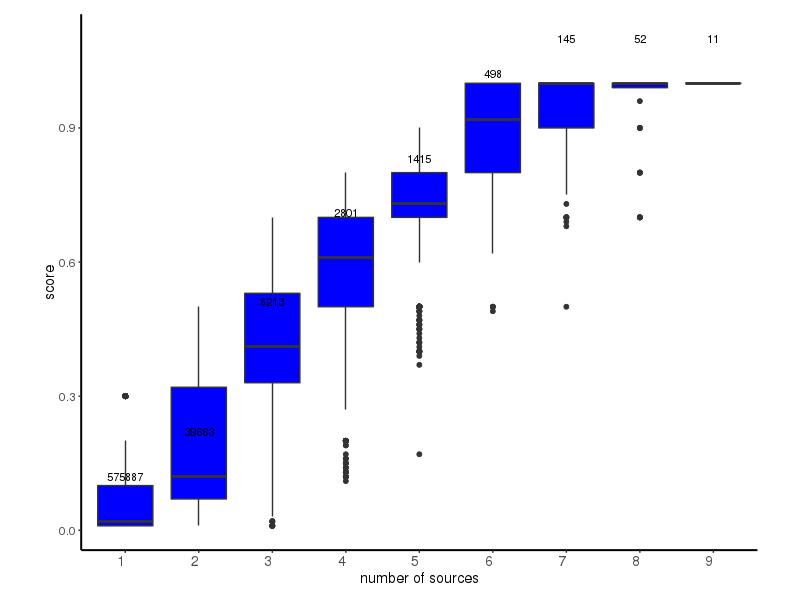 These scores range from 0 to 1, and take into account the number and type of sources (level of curation, model organisms), and the number of publications supporting the association. The DSI ranges from 0.25 to 1. Example: TNF, associated to more than 1,500 diseases, has a DSI of 0.263, while HCN2 is associated to one disease, with a DSI of 1. If the DSI is empty, it implies that the gene/variant is associated only to phenotypes. The DPI ranges from 0 to 1. Example: gene KCNT1 is associated to 39 diseases, 4 disease groups, and 18 phenotypes. 29 out of the 39 diseases have a MeSH disease class. The 29 diseases are associated to 5 different MeSH classes. The DPI index for KCNT1 = 5/29 ~ 0.172. Nevertheless, gene APOE, associated to more than 700 diseases of 27 disease classes has a DPI of 0.931. If the gene/variant has no DPI value, it implies that the gene/variant is associated only to phenotypes, or that the associated diseases do not map to any MeSH classes. The Evidence Level (EL) is a metric developed by ClinGen that measures the strength of evidence of a gene-disease relationship that correlates to a qualitative classification: "Definitive", "Strong", "Moderate", "Limited", "Conflicting Evidence", or "No Reported Evidence" (Strande et al., 2017 ). GDAs that have been reported by ClinGen will have their corresponding Evidence Level. Furthermore, we have adapted a similar metric reported by Genomics England PanelApp to correspond to the same categories from ClinGen: GDAs marked by Genomics England PanelApp as High Evidence are labeled as strong in DisGeNET. Those labeled as Moderate Evidence are labeled as moderate and LowEvidence associations are labeled as limited. We have labeled GDAs with no evidence level as "No reported evidence". 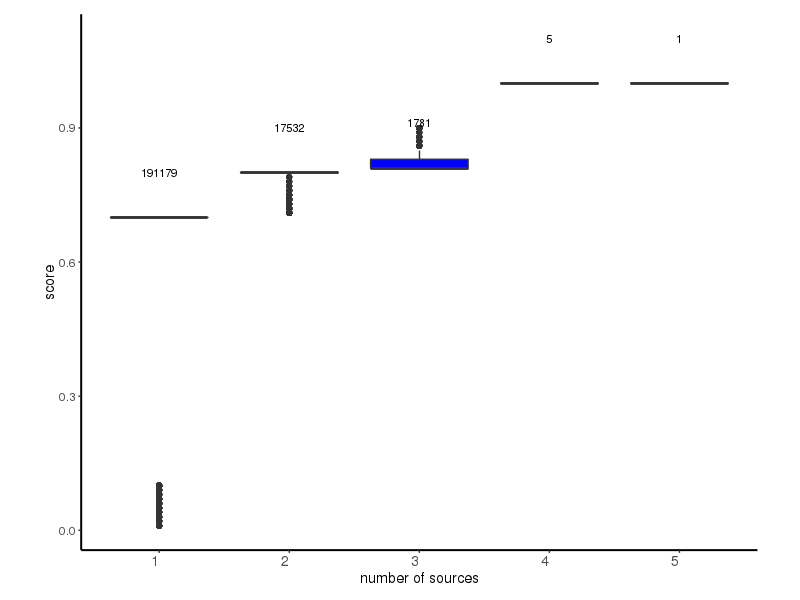 EI = 1 indicates that all the publications support the GDA or the VDA, while EI < 1 indicates that there are publications that assert that there is no association between the gene/variants and the disease. If the gene/variant has no EI value, it indicates that the index has not been computed for this association. In order to ease the interpretation and analysis of gene-disease, and variant-disease associations, we provide the following information for the data. For human genes, HGNC symbols, and Uniprot accession numbers (used by Uniprot) are converted to NCBI Entrez gene identifiers using an in house dictionary that crossreferences HGNC, Uniprot and NCBI-Gene information. For mapping of mouse and rat genes, we used files HOM_MouseHumanSequence, and RGD_ORTHOLOGS, both with information of orthology from MGD and RGD, respectively to map rat and mouse Entrez gene identifiers to human Entrez identifiers. We discarded the associations involving rat or mouse genes without a human ortholog. the top level Panther protein class. These attributes are retrieved from dbSNP, the NCBI Short Genetic Variations database a catalog of short variations in nucleotide sequences from a wide range of organisms ( Sherry, et al., 2001 ). The data was retrieved in May, 2018 (corresponding to NCBI dbSNP Human Build 151, and to Assembly GRCh38). The Genome Aggregation Database is a resource that aggregates and harmonizes both exome and genome sequencing data from a wide variety of large-scale sequencing projects ( Exome Aggregation Consortium, 2016). The data spans 125,748 exomes and 15,708 genomes from unrelated individuals sequenced as part of various disease-specific and population genetic studies, totalling 141,456 individuals ( release 2.1). The Ensembl Variant Effect Predictor determines the effect of a variant, or a list of variants (SNPs, insertions, deletions, CNVs or structural variants) on genes, transcripts, and protein sequence, as well as regulatory regions ( McLaren et al, 2016 ). We use the the Ensembl API (release 9.0) to obtain the most severe consequence type of the variant. The vocabulary used for diseases in DisGeNET are the Concept Unique Identifiers (CUIs) from the Unified Medical Language System®(UMLS) Metathesaurus®(version UMLS 2018AA). The repositories of gene-disease associations use different disease vocabularies, OMIM® terms for diseases from UniProt, CTDTM, and MGD; MeSH terms used by CTDTM, LHGDN, and RGD; MONDO for ClinGen; HPO indentifiers for HPO, UMLS® CUIs from CLINVAR and PsyGeNET; EFO for the GWAS Catalog; Orphanet identifiers are mapped using Orphanet cross-references and MESH, EFO and DO vocabularies for GWASdb. Disease names from the Genomics England PanelApp, and the Cancer Genome Interpreter are normalized using the UMLS Metathesaurus. We also used UMLS® Metathesaurus® concept structure to map OMIM, HPO and MeSH terms to UMLS® CUIs. the MeSH class: We classify the diseases according the MeSH hierarchy using the upper level concepts of the MeSH tree branch C (Diseases) plus three concepts of the F branch (Psychiatry and Psychology: "Behavior and Behavior Mechanisms", "Psychological Phenomena and Processes", and "Mental Disorders"). The top level concepts from the Human DiseaseOntology. The DisGeNET disease type: disease, phenotype and group. These classifications were manually checked. In addition, disease entries referring to disease groups such as "Cardiovascular Diseases", "Autoimmune Diseases", "Neurodegenerative Diseases, and "Lung Neoplasms" were classified as disease group . For a seamless integration of gene-disease association data, we developed the DisGeNET association type ontology. All association types as found in the original source databases are formally structured from a parent GeneDiseaseAssociation class if there is a relationship between the gene/protein and the disease, and represented as ontological classes. For more information, see here. For a seamless integration of gene-disease association data, we developed the DisGeNET association type ontology. All association types as found in the original source databases are formally structured from a parent GeneDiseaseAssociation class if there is a relationship between the gene/protein and the disease, and represented as ontological classes. It is an OWL ontology that has been integrated into the Sematicscience Integrated Ontology (SIO), which is an OWL ontology that provides essential types and relations for the rich description of objects, processes and their attributes [PDF]. You can check SIO gene-disease association classes from this URL or download the entire SIO OWL-DL ontology file . The SIO ontology can be also accessed at the NCBO Bioportal. DisGeNET GDAs in RDF are semantically harmonized using SIO classes. The DisGeNET association type ontology is depicted below. Therapeutic: This relationship indicates that the gene/protein has a therapeutic role in the amelioration of the disease. Biomarker: This relationship indicates that the gene/protein either plays a role in the etiology of the disease (e.g. participates in the molecular mechanism that leads to disease) or is a biomarker for a disease. Genomic Alterations: This relationship indicates that a genomic alteration is linked to the gene associated with the disease phenotype. GeneticVariation: This relationship indicates that a sequence variation (a mutation, a SNP) is associated with the disease phenotype, but there is still no evidence to say that the variation causes the disease. Causal Mutation: This relationship indicates that there are allelic variants or mutations known to cause the disease. Germline Causal Mutation: This relationship indicates that there are germline allelic variants or mutations known to cause the disease, and they may be passed on to offspring. Somatic Causal Mutation: This relationship indicates that there are somatic allelic variants or mutations known to cause the disease, but they may not be passed on to offspring. Chromosomal Rearrangement: This relationship indicates that a gene is included in a chromosomal rearrangement associated with a particular manifestation of the disease. Fusion Gene: This relationship indicates that the fusion between two different genes (between promoter and/or other coding DNA regions) is associated with the disease. Susceptibility Mutation: This relationship indicates that a gene mutation in a germ cell that predisposes to the development of a disorder, and that is necessary but not sufficient for the manifestation of the disease. Modifying Mutation: This relationship indicates that a gene mutation is known to modify the clinical presentation of the disease. Germline Modifying Mutation: This relationship indicates that a germline gene mutation modifies the clinical presentation of the disease, and it may be passed on to offspring. Somatic Modifying Mutation: This relationship indicates that a somatic gene mutation modifies the clinical presentation of the disease, but it may not be passed on to offspring. AlteredExpression: This relationship indicates that an altered expression of the gene is associated with the disease phenotype. Post-translational Modification: This relationship indicates that alterations in the function of the protein by means of post-translational modifications (methylation or phosphorylation of the protein) are associated with the disease phenotype. New attributes added to bulk file downloads. 254 clinical concepts were reclassified as "group"